Recently Binny's got in four private selection barrels of Knob Creek Rye. I happened to be in my local store as they got the boxes in, and I grabbed a bottle of whatever was in the top box. It just happened to be this barrel #6870. As with most Knob Creek store selects, I felt that I just couldn't go wrong. Granted, these are about $5 more than the store select bourbons, but still worth it. The last such bottle that I had was decent. It didn't blow me away or anything, but it was certainly better than the standard rye, and it did not make me in any way shy away from trying another. Overall, at first I wasn't big on this one, but by the end, it had really grown on me. As a quick disclaimer, however, I may be a bit impartial due to the situation in which I drank a good portion of this bottle and the experience I now associate with it. 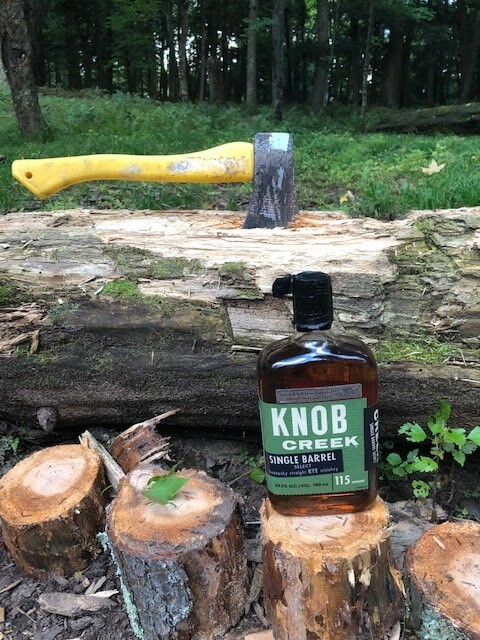 I first opened this bottle while on a canoe trip in the Upper Peninsula of Michigan. I had never done anything quite like this, and while I've been camping a million times, I had never been "wilderness" camping, where there are zero amenities, and the closest civilization is a two hour canoe ride away. It was under these circumstances that I first opened, poured and enjoyed this rye, and I have to say, it was a great pour for the moment. The nose was malty and piney. It had a certain amount of cinnamon spice that I've come to expect, but the pine notes really suited the scene, sitting next to a campfire in the middle of a forest, surrounded by pine trees and only the light of the fire to remind me where I was. Interestingly, I also got a peach note from the nose. This was a first for me, though I didn't find it offensive or anything. Just . . . different. My initial impressions upon tasting was that it came across as watered down, despite its high proof. The flavor was almost all cinnamon and pine. That spicy and woody flavor seemed to last from front to back. It had a bit of a fleeting mint flavor on the back end which I really enjoyed and wished had stuck around a bit more. Those first few pours while camping, though, seemed to suit the scene well. Of course, I didn't finish the bottle in that one night, and I continued to work my way through during the weeks that followed from the comfort of my couch. However, I found myself enjoying this rye more and more with each glass I poured. It sweetened up significantly, with a nice brown sugar flavor that really took center stage. The pine and cinnamon notes remained, but they took a back seat, and some of the rough edges that had previously come with those flavors were gone. What was left at the end of this bottle was a sweet and rich whiskey. Though it wasn't overly complex, it was completely delicious, and the high proof never got in the way of the flavor. This bottle renewed my faith in the store pick Knob Creek Ryes.